Kumi Korf: "It is a magic moment, each time when the dampened paper is peeled off from the plate, revealing the transferred image from plate to paper. I love the surface of the copper plate, polished, worked, inked, and wiped. My technique of intaglio printing is traditional, however the experience is more like painting than printing for me." Ithaca, New York: Olive Branch Press, 2014. Edition of 10. Four 31 x 19" prints folded to form four sections of 8 pages, 7.75 x 9.5". 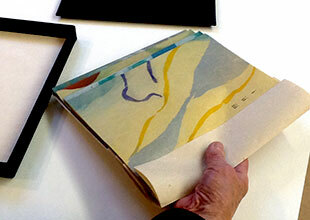 Each section slips into an accordion binding. Colophon constitutes the end page. Intaglio prints. Letterpress on Japanese paper. Laid in 10.5 x 10.5" cloth-covered lidded box with title on cover. Numbered. Signed by the poet and artist. "Delirium" is a collaboration between artist Kumi Korf and poet Bhisham Bherwani. 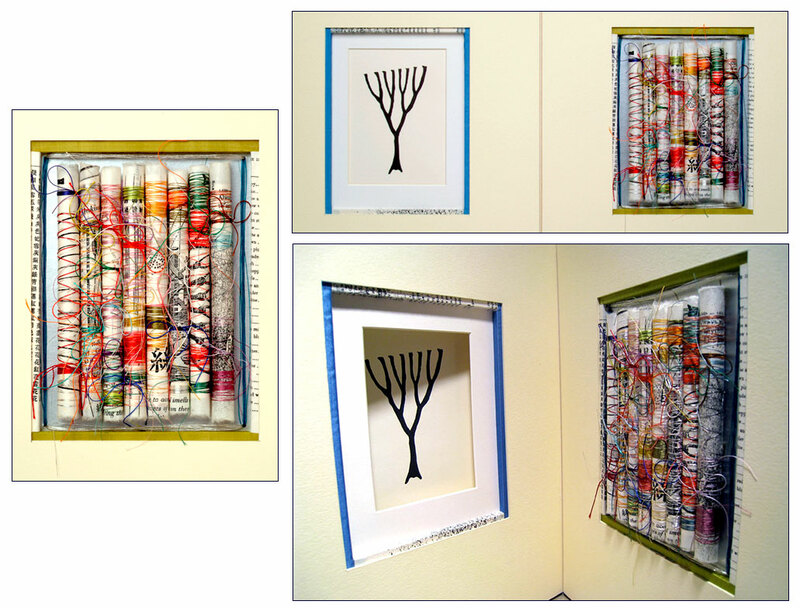 The four prints were originally hang-on-the=wall art, which Korf cut and folded. "Nature has been a perennial, inexhaustible mother lode for poets from Virgil to Robert Frost. I was under the spell of Japanese Haiku masters and of American imagist and symbolist poets such as Ezra Pound, Wallace Stevens, and William Carlos Williams when I composed ‘Delirium.’ The poem traces recurring cycles in nature, such as those of life, from birth to death, and of seasons, from spring to winter. ‘Delirium,’ a sequence of twelve segments propelled by such passages of life and time, found a natural counterpoint in Kumi's sensibility, in her visual aesthetic that embodies both precision and mystery." Rebecca Rafferty, The Visual Artworker, July 24, 2014: "Kumi's prints are biomorphic abstractions — gentle curves and attractive color which she develops intuitively in series — one thing leads to another. 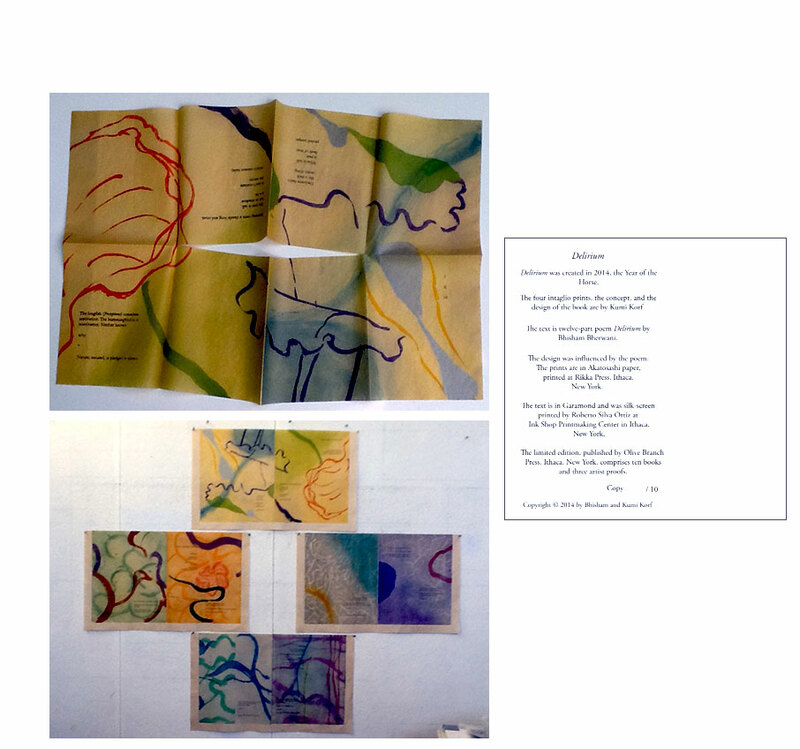 Her art creates a field for a poem written by Bhisham Bherwani." Cavankerry Press: "Bhisham Bherwani studied Fine Arts at New England College. He is also a graduate of New York University and Cornell University, and the recipient of fellowships and scholarships from The Bread Loaf Writers' Conference, New England College, and The Frost Place, as well as a residency fellowship at the Constance Saltonstall Foundation. He was born in Bombay, India; he lives in New York City." Ithaca, New York: Kumi Korf, 2012. Edition of 20 + 2 AP. Size: book cover – 8.1 x 11.375x .75" closed; book -7.5" x 11" closed, 7.5" x 25" extended; box - 8.5 x 12 x 1.25" closed. Materials: Akatosashi paper, Masa waxed paper, Denril, Stainless steel wire, silk thread and book cloth. Techniques: intaglio prints and silk screen printing. Text set and silk-screened in Garamond typeface by Roberto Silva Ortiz. 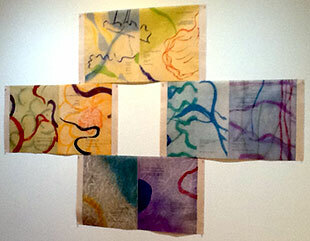 Intaglio prints by Kumi Korf at Printmaking Center in Ithaca. Binding: Accordion Pleats, stepped. Pages were sewn into valleys of accordion folds with pamphlet stitching. Concept, design and binding by Kumi Korf. Numbered. "The Alphabet of My Phobias" features verses by Maia Vidal from her CD God is My Bike (2011). 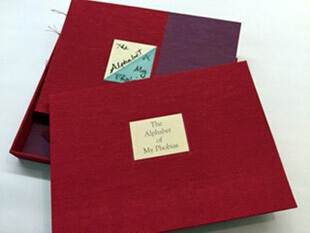 Each page is a triangle that folds out to reveal the meaning for that letter of the alphabet. The introductory verse by Vidal lets the reader know that this is not necessarily going to be a fun and happy reading - alphabetically speaking. "I want to write a song about the words that I cut out of my verbal repertoire." She gives us "words I cannot say in hopes they go away" such as Abortion and Climate Change. 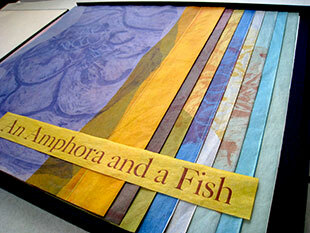 The accordion fold allows the pages to be pulled out into a longer visual panorama of letters, paper, and color. Ithaca, New York: Rikka Press, 2010. Edition of 6. 17 x 8.75 x .5"; 16 pages. Expandable codex. Intaglio prints. Materials: Hahnemühle Copperplate paper, Masa waxed paper, Denril vellum, stainless steel wire, and dental floss. Accordion-fold spine composed of Masa waxed paper and reinforced by Denril vellum. Bound with dental floss and fortified by stainless steel wire. Housed in a hinged linen box with bone clasp closure and title label tipped on top. Kumi Korf: "This is the second book in which I used a structure I invented. Accordion folds hold each page, attached with dental floss, three holes on the page, with stainless steel wire on the backside of each fold as reinforcement. The accordion folds are not equally dimensioned. There is 1/2" difference, allowing a half-inch of the page edges to show when the book is closed. Different colors line up like stripes or folds of clothing similar to the formal attire of court ladies in Japan thousands of years ago. The pages are printed on both sides by intaglio techniques. "We look up at clouds all the time. They are, visually, so much a part of our daily life. One artist that comes to mind is Constable. His studies of clouds are almost abstract paintings. Clouds are shapely but abstract." Ithaca, New York: Rikka Press, 2010. Edition of 20. 13.4 x 13.4 x 1.5" lidded box containing 12.75 x 12.75 x .5" octagon. Four triangles and four squares connected by hinges form a folding octagon structure with a hole in the center. 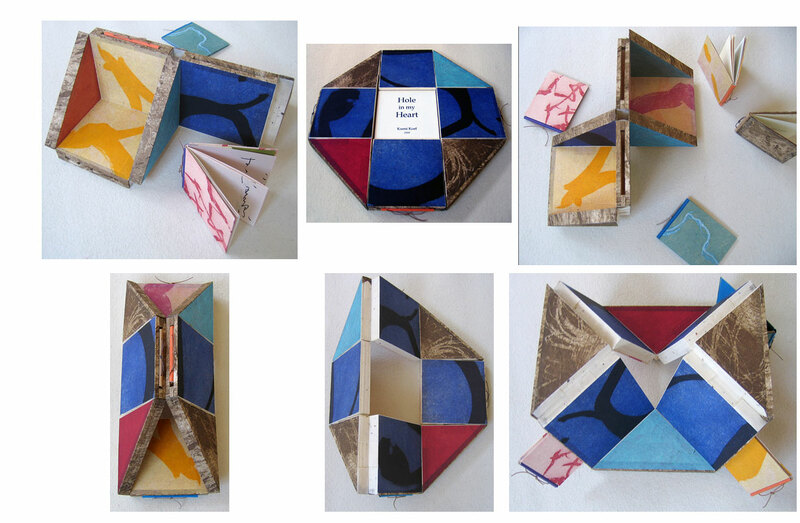 Four 3.75 x 3"books with 10 leaves each slip into cavities that have been cut into the outside edges of the four squares. The squares and triangles are covered with papers that are Kumi Korf's intaglio prints printed by Christa Wolf on Akatosashi paper. Text is set in Electra and letterpress printed on Kitakata paper by Roni Gross. Box lid covered with a print with title inset. By folding and twisting the octagon, multiple symbolic structures can be created. The hidden books contain poems by four Japanese court women who used poetry to fill the holes in their hearts. Colophon: "The concept of this book, the structural design and the selection of the four poems from Japanese women are by the artist. The four poems are: Ono no Komachi (9th century), Izumi Shikibu (10 -11th century), Hachijo-In no Takakura (13th century), and Go-Saga In Chunagon no Suke (14th century). "Across the centuries, their sorrow and sadness reach us in our hearts. Creating their poetry in turn, each one of them gracefully accepted the human condition. In expressing their grief, the holes in their hearts were filled with poetry and the play of words using 5-7-5-7-7 syllables of the tanka format." Kumi Korf: "The women poets in my Hole in My Heart were women serving at Emperors' courts in order to make their wives' surrounding culturally glamorous. They had cubicles partitioned by screens made of beautiful fabrics. My structure of Hole has two distinct such cubicle positions – two cubicles each." 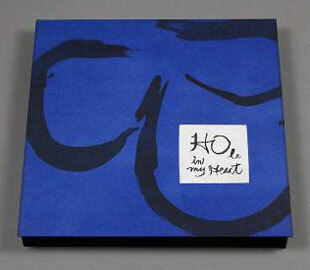 Marjorie Olds, "Hidden Books - Kumi Korf puts her feelings down on paper," The Ithaca Times: "When we discussed what is hidden from view in Korf's work, she described how what we feel and what we see are inextricably bound together: One of her artists' books, Hole in My Heart, is based on poems written by women in the ninth and tenth centuries. Many of the stories are woven into sad love songs. The book appears to have a hole in its center an that reflects the sadness in the heart of the poets, who nonetheless, despite their sorrows, went on to create the poems we still read." Ithaca, New York: Kumi Korf, 2004. Edition of 3 + 1 AP + 1 Prototype. 20.5 x 24.25 x 1.25"; 7 pages. Intaglio plates printed on Akatosashi paper. Letterpress. Japanese papers. Text printed by Blacks Corner Letterpress. Binding designed and executed by the artist. An original story by Kumi Korf accompanied by her illustrations in intaglio. Kumi Korf: "The visual experiences that move me, color, composition, and luminosity, are in nature around me. I feel that I am grounded in observation of it. I hope that the translation of what I observe turns into color, shapes, and brush strokes, and it is my wish to evoke the spiritual through the visual." 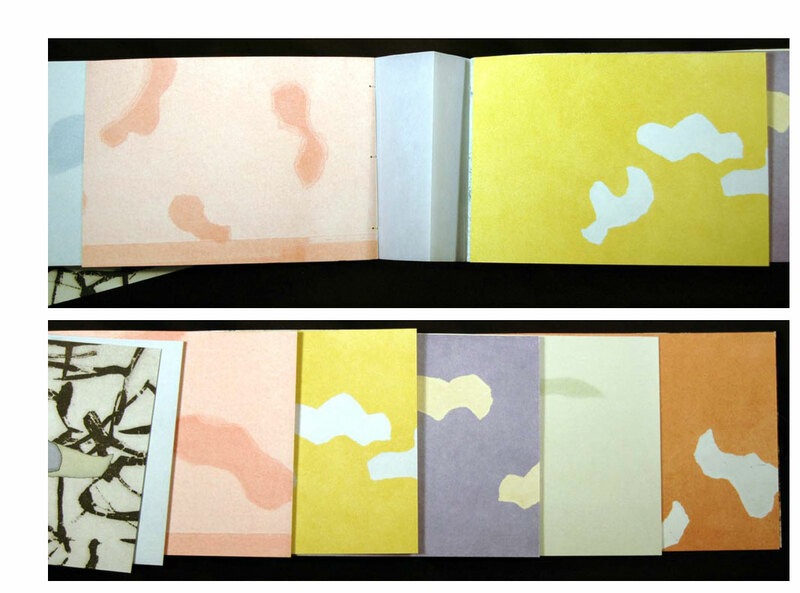 Mark Dimunation (Chief of the Rare Book and Special Collections Division, Library of Congress): "Kumi Korf’s artists’ books are not only concerned with structure, but also with printmaking and the relationship of illustration to text. They are extremely complicated, very rich. I feel they are good representations of a certain kind of work that’s being done in America. So that’s why her particular books have been added to the Library of Congress. "Her books have interesting elements of construction, questioning how a book operates, but more importantly and I think most expressively of Kumi is the intense quality of the prints. They are both an important aspect of her Japanese background, but they’re being done in a very modern American way. Her prints tell the story, but they also move you through the book. And because many of her prints are large, and broken up, they have an abstract level to them that reads as a very modern American book. They document the Book Arts movement in America on many different levels." Ithaca, New York: Kumi Korf, 1985. Edition 20. 15 x 11", 10 pages including free end page. Photo offset, xerography. 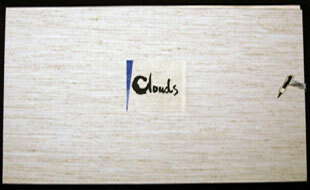 Materials: Japanese paper, silk thread, museum board, foam core board, book cloth. Kumi Korf, In & Out of Sculptural Books: "I discovered my passion for book arts when creating the collaborative piece 'Silk and Secrecy.' 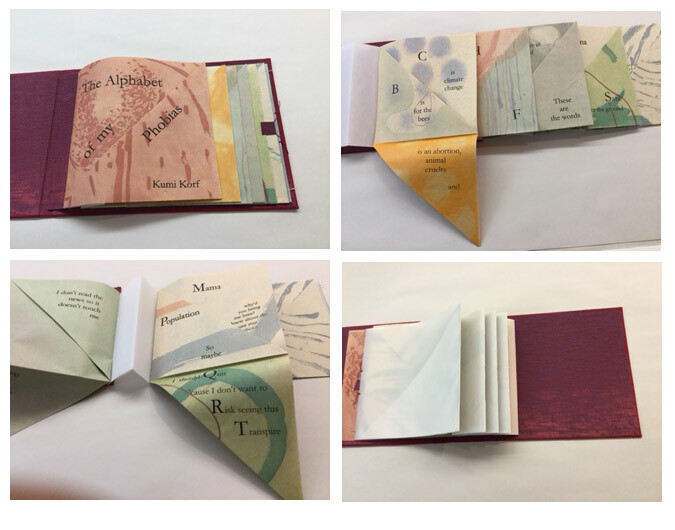 I needed a book structure that could hold both traditional letterset text pages as well as a three-dimensional collage; I was searching for a form that would open and close effortlessly, behave as an ordinary book, but also hold a surprise for the reader. After a few missteps, I found a solution. Since that time, artists' books, and particularly the process of inventing new structures, has been an enduring passion." Cerritos Public Library: "With text by Emoretta Yang, Silk and Secrecy obtains literary histories of silk and its importance in the ancient and modern worlds. 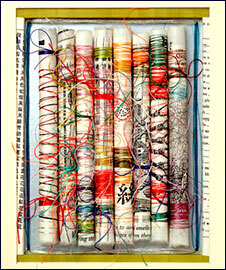 The book opens to reveal a cut-out window through which long spools of handmade paper covered with multicolored strands of silk threads can be seen. The piece is the first part of Kumi Korf's Figured Silks series." So carefully did the ancient Seres guard the secret of silk-making that in the first century Pliny would report that silk was a product of their forests.